New York – High school students were injured in an escalator accident according to school officials. They say that at least ten injured students required emergency medical evaluation or treatment. Some of these were for a toe amputation, lacerations and for possible broken bones and arm or leg injury. It is unclear as to exactly what caused the school injury and safety inspectors were looking into the incident. Some people who are familiar with the injuries believe that it may have been caused by a mechanical malfunction. Parents fear that the injuries may have been due to negligent maintenance of the machinery. However, the possibilities that this incident started with a trip and fall accident or a child who’s clothing simple got stuck in the escalator haven’t been ruled out. Investigators will continue to evaluate the situation and will keep the escalator closed until the situation is deemed safe. See this article to find out more. New York – A workman who was collecting garbage was hit by a car according to the victim’s report. The driver of the car admits that his vehicle made contact with the worker but he described in as a minor accident. He explains that this was the reason he left the scene of the accident with injuries. Police then looked into the hit-and-run collision and questioned the driver. The driver has placed the blame for the pedestrian accident on the sanitation worker. He noted that the side mirror casing of the car is what hit the victim. The worker who was injured on the job has reported that he suffered a hand injury. Trauma specialists explain that this type of mechanism of collision can lead to various injuries, including broken bones or fractures, ligament and tendon injury or even nerve damage or vascular wounds. Further investigation into both the injuries and liability for the crash is necessary to determine fault and a causal relationship. However, some believe that the driver may have been negligent and that his fleeing the scene of the crash was criminal. A top New York personal injury lawyer notes that the employer most likely is required to carry worker’s compensation insurance. This worker’s comp carrier often must pay for medical care while the victim works out the legal aspect in court. See this article for more about this work injury. New York – Work crews were working at a construction site in the Kew Gardens neighborhood of Queens when a heavy metal beam fell onto a worker. The crush victim suffered leg injuries, including multiple broken bones in his legs after being trapped under the metal beam. The heavy steal I-beam was being used as a hammer by a crane to drive metal supports into the ground when it fell. According to witnesses, the hammer beam was suspended by the crane’s cable that broke. Investigators are looking into the reason for this apparent equipment failure that caused the accident. 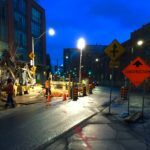 Experts say that the crane and its cable may not have been properly rated to hold such a heavy object such as this seven ton beam. However, other possibilities include that negligent maintenance or safety inspections could have led to the catastrophic collapse and the hardhat worker’s subsequent crush injury. The injury victim was rescued from the work accident site and taken to Jamaica Hospital for emergency treatment. To find out more about this worker’s comp injury, see this article. New York – This 39-year-old woman was injured as a passenger in a vehicle involved in a car crash with a second car in 2013. She suffered multiple injuries, including a bowel perforation due to a seatbelt injury and broken bones. She filed personal injury claims against the drivers of the two vehicles with the help of the injury law specialists of Morrison & Wagner. They helped negotiate a settlement of $375,000. Around 6 p.m. on May 1, 2013, the plaintiff, 39, a factory worker, was a front seat passenger in a 1998 Nissan operated by Defendant A., 23. As the vehicle was travelling westbound on Rappo Drive and approaching the intersection of Simeon Wood Road, in Islip, Suffolk County, a 2012 Hyundai operated by Defendant B who was travelling east bound on Rappo Road, made a left turn in front of the Defendant B’s vehicle. The front of Defendant A’s vehicle collided with the driver’s side door of Defendant B’s vehicle. The Plaintiff sustained injuries to her abdomen, left non-dominant wrist and right foot. Plaintiff sued both defendants. In a consolidated case, Defendant A, through different counsel, sued Defendant B, but the case settled. Plaintiff contended that the defendants were negligent in the operation of their vehicles. The intersection was controlled by a traffic signal. The traffic signal was green for travel on Rappo Road. A witness statement obtained by the police indicated that Defendant A’s head was down as she entered the intersection and there was speculation that she may have been looking down at her cell phone when the accident occurred. Plaintiff contended that Defendant B was negligent in attempting a left turn across oncoming traffic. Plaintiff further contended that Defendant A was negligent in failing to take any evasive action to avoid the accident and for being inattentive. Defendant A claimed she had the right of way, and therefore Defendant B was negligent in making a right turn and failing to yield to oncoming traffic. Defendant B claimed that Defendant A was not paying attention while she entered the intersection. As a result of the impact and the pressure to her abdomen due to the seatbelt, the Plaintiff perforated her bowel. She also sustained a fracture to her left distal radius, and fractures to her right metatarsals, 1 through 4. The plaintiff also sustained pigmentation of her skin near her upper cheek as a result of the air bag deploying. The injured plaintiff was taken by ambulance to Southside Hospital for repair of the small bowel perforation. She underwent an emergency laparoscopy and small bowel repair on May 1, 2013. She remained in the hospital for six days. After discharge from the hospital she underwent physical therapy for her radial and toe fractures, which lasted until December, 2013. Her wrist fracture was casted, and she wore a CAM Walker boot for her right toe fractures. She is left with keloid scarring along the abdomen. The plaintiff claims she has trouble now when lifting things with her left hand, and that when there is any pressure on her abdomen, she has pain. This includes that she can no longer sleep on her stomach, as it causes her irritation. The plaintiff missed three weeks of work after the accident and has since returned to work. As the case was proceeding to jury selection, Judge Paul Baisley negotiated a settlement of $375,000 with the insurance carrier for Defendant A tendering their $25,000 policy, and with the insurance company for Defendant B paying $350,000. Editor’s Note: This report is based on information that was provided by plaintiff’s counsel and defense counsel for Defendant A. Defense counsel for Defendant B did not respond to the reporter’s phone calls. Counsel for Defendant A in her consolidated case declined to contribute. New York – A car crash involving a car and motorcycle left the female motorcycle driver dead. She was apparently hit by a car as she was crossing through an intersection. 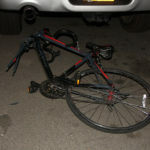 The crash victim was thrown from the bike and suffered a serious head injury. Ambulance and paramedic personnel raced to the scene and found the woman with a multiple injuries, including a traumatic brain injury (TBI). They attempted to treat her severe wounds and transported the victim to the closest hospital emergency room. Hospital officials say that the injury victim was treated for the injuries but died despite best medical efforts. Cause of death appears to be the TBI but further investigation was underway. Trauma specialists explain that a motorcycle accident can cause a variety of life threatening injuries besides a TBI, including spinal injury, internal bleeding, broken bones and arterial hemorrhaging. They say that helmets may prevent some head injuries but not in all circumstances. More serious bike accidents often involve a speeding driver, drunk driving and with reckless drivers. Police would need to examine the circumstances of this car versus motorcycle collision in order to determine who was at fault. See this article for more about this fatal New York bike crash. A tractor-trailer accident on the New Jersey Turnpike left one man dead and three passengers with serious injuries. The truck crash occurred when the truck driver failed to stop for slowing traffic. His truck slammed into a van-sized limousine bus, causing the limo to roll over. The crash victims were rushed to area hospitals for emergency treatment. The accident injuries included broken bones, nose and rib fractures and possible internal injuries. Records show that the truck was owned by the discount retail chain, Walmart, and that the driver was an employee. Recent discoveries indicate that the driver of the tractor had not slept in more than a day, contrary to safety guidelines for commercial drivers. Police believe that the tired driver may have caused the collision due to fatigue. This has led to criminal charges being filed against the truck driver who rear-ended the limo. The bus accident is still being investigated in hopes of fully determining the cause of the crash. Some have speculated that the tractor-trailer was speeding due to the fact that it caused a roll-over accident. Meanwhile, road safety experts warn that Walmart trucks have been involved in many accidents, causing hundreds of injuries and many wrongful deaths. Calls have been made to force the company to better train their drivers, enforce safety laws and improve their monitoring of dangerous driving. See further details about the truck versus bus rear-end collision here.